Send a weekends worth of great goodies with this picnic hamper filled with local treats. 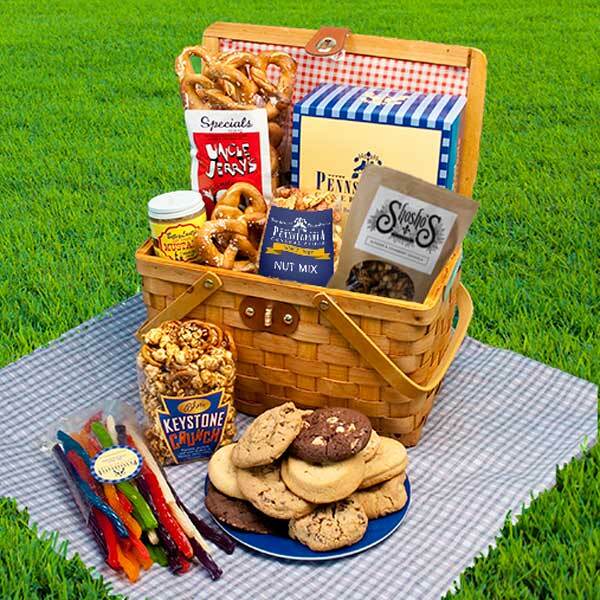 We pack a lovely wooden picnic hamper with 16 fresh baked Hope's Cookies, Asher's Keystone Crunch, hand rolled Uncle Jerry's Hard Pretzels, Betsy Lantz's Hot Sweet Dipping Mustard, Pennsylvania Dutch Licorice, Society Hill Party Mix and Organic Cinnamon Granola. I love buying gift baskets from this site for all my PA and Philly friends.